Will Claye, who already earned a bronze medal in the long jump on Saturday, finished fourth in today’s qualifying for the triple jump to earn a spot in Thursday’s triple jump final. Claye, considered to be the best long and triple jumper, combined, in the world, is fresh off a gold medal in the triple jump at the World Indoor Track and Field Championships in Turkey in March. 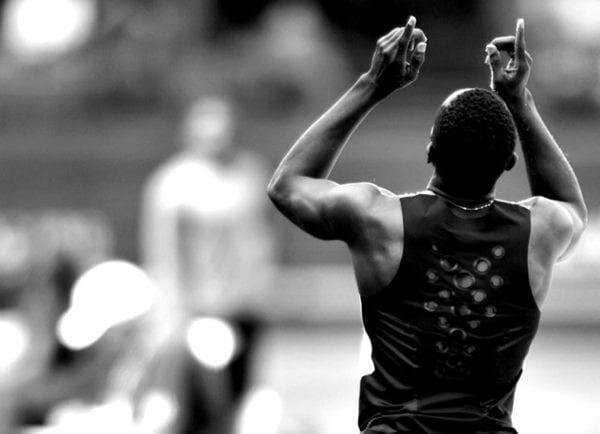 He also won the bronze medal in the triple jump at the 2011 World Outdoor Championships. He is a student at the University of Florida and will return to Florida in September to head back to school. He is an eight-time All-American (at Florida and Oklahoma) and two-time NCAA champion (once at Oklahoma and once at Florida). His grandmother, brother and aunt live in London. Before this Olympics, Claye said his grandmother had never seen him triple jump and his brother hadn’t seen him triple jump in a while. Read this exclusive interview that Sports Spectrum partner 2K Plus International Sports Media had with Claye. Q. How did you begin triple jumping? A. I was a long jumper when I started high school and a hurdler. My high school coach saw something, and he had me do some bounds one day and he felt I was able to triple jump and after that I started triple jumping. My first year jumping, I jumped 45 (feet). My sophomore year in high school, I went 49, and my junior year 52-4, and from there I just stuck with it and it’s been going well since. Q. I saw something that described you as the world’s leading long jumper and triple jumper combined. A. Yeah, it’s a blessing. A lot of people aren’t able to do that. And I feel like I’ve been blessed to do both at an elite level. So, just going to take advantage of it and hopefully, if it’s God’s will, I will go out there and win both long and triple. Q. Is the training the same, or do you do different things? A. Yes, I do different things for each one. I have a long jump day and I have a triple jump day at practice, so completely different–a runup, approach, completely different drills. Yes, the technique is totally different for each one, so you really have to be prepared for each one separately. Q. Assuming you stay injury-free, would you like to continue to do both throughout your career? A. As long as I can, I’m going to do both my whole career if I can. If I qualify and get the standards, then I’ll do both at all the meets I go to. Q. A lot of people had not heard of you before Daegu. A. Yes, that’s true. I guess that was my coming-out party. I’ve been a prominent jumper in the United States since 2009, but not so much on the world level. I‘ve been on four U.S. teams since juniors, but I guess Daegue, (South) Korea, was when the rest of the world found out who I was. Q. Honestly, what were your expectations before going to Deagu? A. My expectations were to medal in both jumps. I felt that there was something there that I didn’t feel before, so I knew I had something. I just wish I would have done better in the long jump as well, but Dwight (Phillips) got the medal for us so I was happy for Dwight. Q. Tell me about your faith. A. I grew up in a Christian household, but I was saved my sophomore year in high school. My brother, he brought me close to God, and just ever since then I just feel like track is what God has given me in order to be a blessing to other people and this is the stage that He has put me on. I feel like everyone has their different ways, blessings that they have gotten from God, and this is what He has for me at this point in my life. Q. What difference does it make having Jesus in your life? A. Oh, it makes a lot. I don’t worry about anything with God there. Saying my prayers, and having my faith, and I just go. I don’t have to worry about anything…a lot of people go out to competition, saying I have this little feeling in my leg, or so and so this and that is going on in my life, but me I just go out there worry-free and do what I have to do. Q. What role does prayer play in your life? A. A big role. Prayer is a big role. Just talking to God, it’s a big role. I feel like throughout the whole day I pray, I talk to God, it’s just a habit. In my mind, I say a prayer before each jump that I take. It’s big. It’s a big part, big part in what I do. Q. What does the Bible mean to you? A. It means a lot. It’s a great book. That’s a way that you can get closer to God, as well, reading the Bible. That’s the way of defeating the enemy. The enemy is always trying to attack you, and if you keep your head in the Bible, and you read it and you understand it, then you’ll be fine. Q. Can you think of a Bible passage that helps or inspires you? A. I read Psalm 91. I read I Corinthians 15. There’s a lot of different passages. My mom, she always sends me a passage before I compete, so I’m always going through different passages, but Psalm 91 is the main one. Q. Tell me about Psalm 91. What does that say to you? A. Just lets you know that God has given you the strength…There may be things going bad around you, but it will not come on to me and I will be fine if I keep faith in God. It just shows that He strengthens you and you don’t have to worry about it and just go ahead and do what you have to do. Q. The triple jump always seems to be a very technical event, and getting your rhythm right, your run-up right; do you find that difficult? Do you have any particular tips you’ve worked on? A. In my past, I haven’t been patient in my jumps. I feel like this year I’m starting to be a little bit more patient in my jumps and not so much worried about hurrying up to get into the pit. They say the best jumps take the longest, so what I’m doing this year is just practicing on being patient and quick off the ground and it’s been working so far.